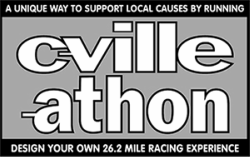 It is tough to select one favorite C-VILLE-athon race from the many fun races for a good purpose. If I had to, I would pick the Independence Day 5K: It is great way to start the independence day, it is a challenging course in a nice neighborhood, and it is my neighborhood. The C-VILLE-athon series is a great motivation to participate at many races that serve a good purpose, and to motivate yourself to try a little harder. My family is on a three year “visit” at Charlottesville and the US. We come from Germany. My wife and I started running together 16 years ago and have finished 8 marathons each in the years 2002 to 2009. We still enjoy very much to run and to compete in shorter races. Running is maybe the most efficient way to stay healthy and fit.